See Madam Chaos in action! This off-kilter instructor grabs kids’ attention, from the first moment of her lecture. 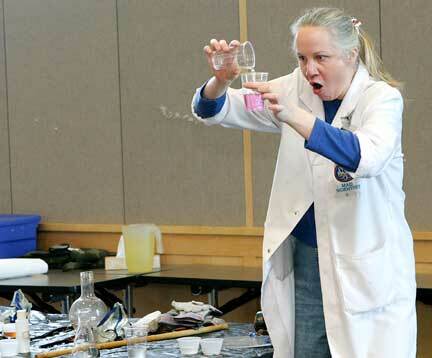 Madam Chaos mixes a color-changing potion to the delight of her young students at Midland Library. 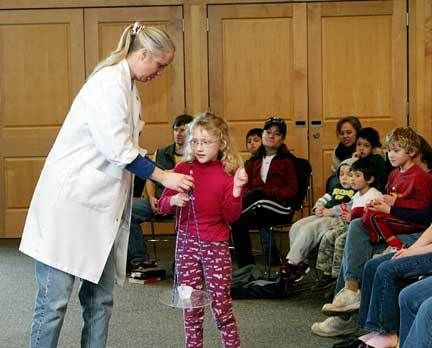 Madam Chaos helps a budding scientist learn about centripetal force, during her interactive course. Mad Science¬ (yes, we’re told it is a registered trademark) is the world’s leading science enrichment provider. They deliver unique, hands-on science experiences for children that are as entertaining as they are educational. Mad Science encourages scientific literacy in children, in an age when science has become as important as reading, writing and arithmetic. For more information regarding Mad Science, see www.madscience.com.